Mercenary Kings came to PC last year, and was revealed for PS4 at E3 in 2013. And now, finally, we have a release date for Mercenary Kings on PlayStation 4. The side-scrolling shoot-‘em-up from Tribute Games is set to launch on April 1st in North America and April 2nd in Europe. 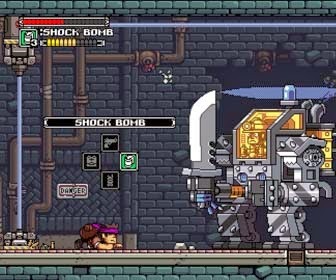 Mercenary Kings is, in essence, a mixture of a side-scrolling old-school shooter like Contra with a loot-heavy quest like... say... Monster Hunter. You can watch recent Mercenary Kings Trailer by clicking the video above. And you can keep an eye on Consoleinfo.be in the coming weeks for our full review.